Copper nails and roves, what size to use.??? I am building a 18ft launch, using copper nails and roves and lapstrake planking. The boards are 1/2 inch thick. It will have an inboard diesel 18 hp engine. The board are 6 inches wide and there will 10 on each side. The question is what size copper nail I should use and how far apart they should be spaced? Where could I find this info. Have several wooden boat building books that describe the technique, but no comments regarding sizes, etc. Comments for Copper nails and roves, what size to use.??? 12guage copper nails with 7/16 roves. This is asuming 1/2in planks with 1 x 7/8 ribs. A fastening every two inches. With planks of this dimension fastenings at 2 1/2 in centres is a watertight joint once swelled. If you are using something like Dolphinite or Pettit's seam compound it is a good idea to prime with red lead first, or even CPES. Is bedding compound designed to be applied to the bare wood or do the boards/planks need to be pretreated?. In theory you shouldn’t need anything along the laps. But I’d be tempted to use some bedding compound. Don’t mix sealant with it. The next question would be whether I should put some type of sealant/putty between the planks as the are being mounted. I will be using bedding compound for the first boards as they attach to the keel assembly, as well as the stem and stern attachments. Should I put some type of sealant before applying putty or bedding or would this hamper any necessary swelling of the planks to make her water tight when launched? 10 gauge should be fine. As you are building her over moulds you will need to nail her before turning her. Depending on how far apart the frames are you will want at least one nail through the laps in between the frames. Mark where the frames are going to be then see how much room you have between. Anywhere between 4 and 6 inches apart should be plenty. Thanks for the helpful chart. I likely will use a 10gauge nail, but am still wondering whether to space it at 3,4 or 6 inches between the nails. It will make a big difference in the amount of rivets/nails and roves needed. The launch has a white oak keel and stem and white cedar lapstrake planking over frames. Therefore the initial boat will need to be turned upside down and internal ribs added after the planking is done. 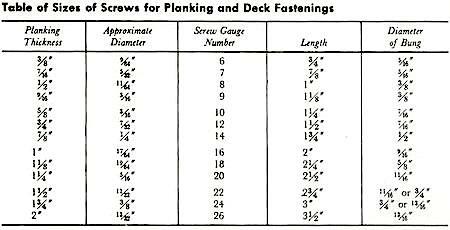 Below is a table from "Herreshoff’s Rules for the Construction of Wooden Yachts"
It only starts with 3/4inch planking and it does relate to carvel construction but at least it gives an idea of the maximum sizes needed. 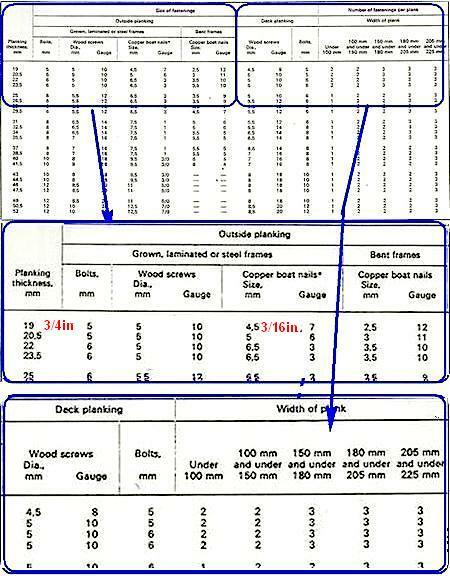 And below is a table showing wood screw sizes. As a rivet and rove has a better holding power than a screw in the same situation this would suggest that a nail gauge of 8 would be way over the top for you construction. The number of nails is going to be governed by the number of frames or ribs. Are you building from plans and if so how many ribs are specified? And are you building her over moulds? Oh, and don’t forget the length, you will want to allow at least 1/2inch showing on the inside to for ease of riveting.